Sara Mohr-Pietsch's guests include organist Robert Quinney, pianists Mark Bebbington and Rebecca Omordia, and baroque cellist Richard Tunnicliffe. Sara Mohr-Pietsch's guests include organist Robert Quinney as he prepares for a concert at the Royal Festival Hall in London for the Belief and Beyond festival. 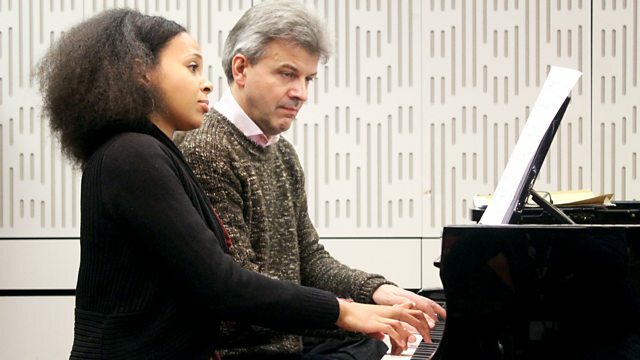 Pianists Mark Bebbington and Rebecca Omordia brings live excerpts of their new Ralph Vaughan Williams disc. Richard Tunnicliffe performs live ahead of his concert at Kings Place which explores the world of the baroque cello as part of the Cello Unwrapped concert series. Performer: Jordi Savall. Director: Jordi Savall. Ensemble: Le Concert des Nations. Performer: Mark Bebbington. Performer: Rebeca Omordia. Performer: Yaniv d'Or. Ensemble: Ensemble NAYA. Ensemble: Barrocade. Conductor: Amit Tiefenbrunn. Music Arranger: Yaniv d'Or. Performer: Christopher Willis. Singer: Jamie Barton. Performer: Emmanuel Pahud. Orchestra: Kammerakademie Potsdam. Conductor: Trevor Pinnock. Performer: Jean-Efflam Bavouzet. Orchestra: BBC Symphony Orchestra. Conductor: Yan Pascal Tortelier. Debussy/Ravel: Works For Piano And Orchestra.